Learn about the great 'basileus' Alexander and the history of his empire with Dr. Varto. Explore the world of the Epicureans and reach a state of tranquility ('ataraxia'). Discover the philosophy of Plato's Socratic dialogues in relation to the maxims of Socrates as presented in Plato's Apology. Registration for the fall term of 2019 is now open. An introductory survey of the traditional religious narratives of ancient civilizations including Mesopotamia, Egypt, Israel, Greece, and Rome. Of special interest: the function of myth in shaping and expressing a culture's understanding of the divine, the institutions of human community (religion, the family, government), and the natural world; the interrelationships of the myths of those civilizations; the reception of those traditions in the origins of Christian and Islamic culture. The traditional narratives and their broader cultural contexts will be approached through study of primary sources including epic, tragic, and didactic poetry, hymnography, historiography, philosophy, the visual arts, and architecture. Held with CLAS 2103 and RELS 1201. NOTES: This course is the first part of the former full-year course CLAS 1100X/Y.06. This course description reflects the entirety of the pair (CLAS 1103.03 and CLAS 1104.03). Together CLAS 1103.03 and CLAS 1104.03 fulfill the BA writing requirement. CLAS 1103.03 must be successfully completed before taking CLAS 1104.03. This course provides students with all the basic tools required for the study of Sanskrit, with a particular emphasis on basic Sanskrit grammar. Students will learn the Devanagari script, several common nominal forms and the basics of the verbal system, as well as develop a competency in basic reading and recitation. An introduction to Classical Hebrew through the study of its basic grammar. The aim of the course is to read texts in Hebrew. NOTES: Students taking this course must register in both X and Y in consecutive terms; credit will be given only if both are completed consecutively. This course introduces key developments in pre-modern science. Fundamental concepts in the physical sciences, astronomy and cosmology are treated through the study of primary sources from antiquity (Near Eastern and Greco-Roman) and the medieval Islamic, Jewish and Christian cultures. We will be attentive to the wider cultural contexts in which science was pursued and to intersections between science and other ways of knowing (e.g., myth, magic, religion). A history of Archaic Greek culture from the Bronze Age palaces of Crete and Mycenae through the development of the Greek city-states. Topics to be discussed include prehistory, palaces and shipwrecks, art and archaeology, the world of Homeric poetry, archaic poetry and thought, colonization, and cultural interaction between the Greek world, the Near East, and Egypt. No knowledge of Greek is expected. We will explore ancient Roman beliefs and practices concerning the afterlife, sexuality, the social duties of men and women, marriage, family life, and slavery. Gladiatorial games, funerals, brothels, temples, and markets are just some of the places at which Romans defined, defended, and denounced each others' identities as mortal, sexual, and economic players. A journey into often alien, always elusive, sometimes alluring aspects of the pre-Christian Mediterranean. We will study some of the most important Platonic dialogues and Aristotelian treatises, to understand the supremely influential views of Plato and Aristotle on divinity, nature, the human, and political community. We will examine the rejection of Platonic-Aristotelian idealism by Stoic, Epicurean and Skeptical schools. Subjects treated include ethics, politics, metaphysics, logic, aesthetics, and psychology. This is an introduction to Latin grammar and syntax designed to bring students with no previous knowledge of Latin to the point where they are able to read Latin prose authors with the help of only a dictionary. NOTES: Completion of CLAS 2401.03 and CLAS 2402.03 satisfies the BA language requirement. The course is an introduction to ancient Greek language through the study of its basic grammar. No previous study or experience of Greek is required or expected. The aim of this course is to give students sufficient preparation to read basic passages of ancient Greek texts and to pursue further intermediate studies in ancient Greek. There are no prerequisites for this course; this is an introductory course. NOTES: This course is the first part of the former full-year course CLAS 2500X/Y.06. This course description reflects the entirety of the pair (CLAS 2505.03 and CLAS 2506.03). CLAS 2505.03 and 2506.03 together fulfill the BA language requirement. This course is a continuation of the study of ancient Greek language at the intermediate level. It continues the study of the language begun introductory ancient Greek. In the course, students review and complete their study of Greek grammar before reading ancient Greek texts in their original language. NOTES: This course is the first part of the former full-year course CLAS 2700X/Y.06. This course description reflects the entirety of the pair (CLAS 2701.03 and CLAS 2702.03). This course is a continuation of Introductory Latin at the intermediate level. It is a study of the poetry and prose literature of Rome through a selection of texts. Particular attention is paid to improving the students' command of the grammar and syntax of the Latin language. NOTES: This course is the first part of the former full-year course CLAS 2800X/Y.06. This course description reflects the entirety of the pair (CLAS 2801.03 and CLAS 2802.03). A study of texts, primarily within the Latin tradition from Augustine to Anselm, but including selected writings of the Pseudo-Dionysius. Three works will normally be read in their entirety: Boethius, Consolation of Philosophy; Dionysius, Mystical Theology; Anselm, Proslogion. The main interest is the use and transformation of the philosophy of Plato, Aristotle, the Stoics and the Neoplatonists in this development. A study of philosophy in the Hellenistic Age. We will investigate the development of Greek and Roman Philosophy, focusing on Pyrrhonian and Academic Scepticism, as well as Middle Platonism. The course covers the logic, physics, and ethics of these philosophical schools, as well as their religious dimension. A Greek reading course on epic, exploring the works of Homer and/or Hesiod. Texts will be read in Greek. 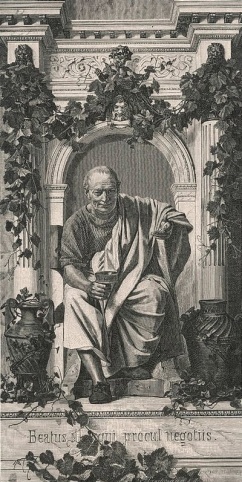 A reading course that solidifies the student's command of grammar and syntax while exploring the theme of fate and empire in the works of authors such as Sallust, Ovid, Virgil, Livy, and Horace. Texts will be read in Latin. This course normally focuses on a single philosophical text by a Latin author of the Middle Ages whose work is engaged with Aristotle and the Greek and Latin commentary traditions. Does god exist? Can God be known? Have a nature? Do evil? Beginning by occupying the same ground as religion, philosophy has asked these questions. Starting with Pythagoras, Empedocles, Plato, Aristotle, Epicurus, and continuing with their pagan Jewish, Christian, and Islamic followers, we shall learn to state the answers of sages and mystics with historical accuracy and to judge their persuasive power. This course will look at how the body was viewed in ancient scientific theory and practice. Western medicine as a rationalized scientific practice finds it origins in the ancient Greek philosophical and medical texts attributed to “Hippocrates”. Through a close reading of selected ancient medical texts, this course will explore ideas of how the human body is constituted, how it relates to the Cosmos as a whole, what the role of the physician was seen to be, and how illness and healing were seen as changes in the balance of the components of the body. This course examines the origins, refinement, and eventual collapse of the Roman military machine. Grand strategy, field tactics, and the analysis of specific battles complement our study of the changing relationship between the army and Roman society and the former's role in building and breaking the political order from 500 BC to 500 AD. This class is a continuation of CLAS 2401.03: Introductory Latin I. This is an introduction to Latin grammar and syntax designed to bring students with no previous knowledge of Latin to the point where they are able to read Latin prose authors with the help of only a dictionary. The aim of this course is to give students sufficient preparation to read basic passages of ancient Greek texts and to pursue further intermediate studies in ancient Greek. NOTES: This course is the second part of the former full-year course CLAS 2500X/Y.06. This course description reflects the entirety of the pair (CLAS 2505.03 and CLAS 2506.03). CLAS 2505.03 and 2506.03 together fulfill the BA language requirement. This course offers an introduction to the art and architecture of the ancient Near Eastern and Classical worlds, with an emphasis on understanding cultures through their artistic and material remains. Various types and forms of artistic expression will be considered as they develop and change over time and space in their social, political, intellectual, and religious contexts. In all of the cultures of antiquity there were specialists who claimed knowledge of future events based on the reading of ominous "signs" in various media, earthly and heavenly. This course examines the history of divination and astrology in Mesopotamia, Egypt, Greece and Rome from a multidisciplinary perspective. A study of texts which reflect the transformation of the ancient philosophical tradition within the works of medieval Arabic and Jewish thinkers and of the Latin Christians to whom they mediated ancient philosophy. Selections from al-Farabi, Moses Maimonides, Averroes, and Aquinas, among others will be read. Bonaventure's The Mind's Journey into God will be read in its entirety. This seminar involves the detailed study of a group of dialogues. The choice of dialogues varies from year to year. NOTES: This course is the first part of the former full-year course CLAS 3400X/Y.06. This course description reflects the entirety of the pair (CLAS 3403.03 and CLAS 3404.03). Greek tragedy was a product of the democratic society of fifth century Athens and played a vital role in the life of the community. This course explores the nature and development of the tragic genre through a study of the plays of Aeschylus, Sophocles, and Euripides in translation. The tragedies are examined as literary texts and in terms of their mythical background and cultural context. Topics to be studied include the conventions of the genre; the nature of tragic heroism; aspects of staging and performance; ancient & modern theories of tragedy. A Greek reading course on tragedy, exploring the works of Aeschylus, Sophocles, and/or Euripides. Texts will be read in ancient Greek. A reading course that solidifies the student's command of grammar and syntax while exploring the themes of war and peace in the works of authors such as Cicero, Virgil, Catullus, and Horace. Texts will be read in Latin. John of Damascus (d. 749) is one of the greatest Christian theologians of the Patristic age. Though he wrote in Greek, he was a Christian Arab (his Arabic name is Mansur ibn Sarjun), who lived under Muslim rule and was employed as a public official in the Umayyad administration in Damascus. The course will focus on his theological works (especially his summa of Christian theology, entitled On the Orthodox Faith, and his three treatises in defence of the icons), their Christian sources, and their Islamic context. In this course, we shall stage an encounter between the two great thinkers - Plato and Heidegger - whose thought has often been thought to mark the ‘beginning’ and the ‘end’ of the Western philosophical tradition. Taking Parmenides’ pregnant insight (“Being and Thinking are the same”) as the poietic site of this encounter, we will ask what it still means to engage in philosophy today. An exploration of the stories that shaped the ancient world’s view of the divine, of human community, and of the natural world. How did myths develop? How did they survive in the Christian and Islamic worlds? From literature to religion to philosophy and art, we explore the enduring appeal of the mythic imagination.This course fulfills the 1st Year Writing Requirement. Introductory classes and the more elementary classes in ancient history and religions and classical philosophy do not require knowledge of the ancient languages. But students who plan to do advanced work in any of these areas are advised to begin study of the appropriate languages as early as possible. Undertake the exploration of one of history’s most satisfying linguistic challenges: the iron language of the Emperors. This course covers the period in Ancient Philosophy from Thales to Plato: Pre-Socratics, Sophists, Minor Socratics, and selected Platonic dialogues. This course is designed to introduce students to the heroic epics of the Ancient Greek world. Texts are read in translation and will be selected from the works of Hesiod, Homer, and Apollonius of Rhodes. Topics to be discussed will include the cultural background of the Homeric world; the nature of oral poetry; oral vs. literate culture; conventions of the epic genre; the heroic code; the relationship between the human and divine world. A reading course that solidifies the student's command of grammar and syntax while exploring the themes of the human and the divine in the works of authors such as Apuleius, Virgil, Ovid, and Horace. Texts will be read in Latin. Sappho is simultaneously one of the most famous ancient authors and one of the most problematic. 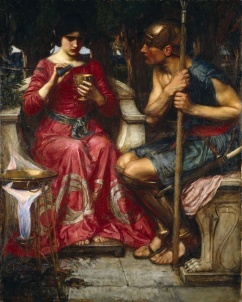 Once acclaimed as the most sublime lyric poet of antiquity, even as the "tenth Muse," she reaches us in only a handful of intact poems (together with numerous fragments); therefore, in this class we will employ the full range of scholarly tools (aesthetic interpretation, historical-literary context, theories of performance, analysis of metre and dialect, papyrology) in attempting to assess both Sappho's mostly lost corpus and her legacy in the modern world. A history of Classical Greek culture from the rise of Athens and Sparta as the dominant Greek city-states to the fall of Athens in the Peloponnesian Wars and the death of Socrates. Topics to be discussed include the rise of democracy, the culture and society of the Athenian ‘Golden Ages’, drama, art and architecture, empire building, and the Greeks at war, first with the Persian Empire and then with each other. No knowledge of Greek is expected. One of the most controversial new theories in consciousness studies is actually one of the oldest and most common ideas in the history of philosophy. Panpsychism, the view that mind is a fundamental feature of the physical world, goes back to Thales among the Greeks, and has numerous defenders in Hellenic, Hellenistic, late Ancient, Medieval, Renaissance, and Modern philosophy. This class will begin from a consideration of contemporary arguments for panpsychism in Nagel, Chalmers, and Strawson before turning to explore panpsychist views from Thales to Leibniz. A study of the 13 books of Augustine's Confessions. A careful reading of an Aristotelian treatise, or selections from several treatises. The treatise studied will vary from year to year . Ancient Comedy ranges from the boisterous and bawdy plays of Old Comedy through the domestic and romantic ‘tragicomedies’ of Euripides to the boy-meets-girl stories of Greek and Roman New Comedy. This course examines the origins and development of the comic genre in the Greek and Roman world through a study of the plays of Aristophanes, Euripides, Menander, Plautus, and Terence in translation. It considers the nature of comedy and its function within society as well as the basic techniques and conventions of the genre itself. Topics to be studied include the ‘comic hero’; comic stereotypes; types of humor; the relationship between actor & spectator. A Greek reading course on historical texts, exploring the works of authors such as Herodotus, Thucydides, Lysias, and Plutarch. Texts will be read in ancient Greek. A reading course that solidifies the student's command of grammar and syntax while exploring the themes of myth and history in the works of authors such as Apuleius, Livy, Virgil, and Horace. Texts will be read in Latin. *Introductory classes and the more elementary classes in ancient history and religions and classical philosophy do not require knowledge of the ancient languages. But students who plan to do advanced work in any of these areas are advised to begin study of the appropriate languages as early as possible. **In order to fulfill all university credit requirements, students expecting to take an honours or combined honours degree in Classics should sign up for CLAS 2710 or CLAS 2810.